Nope, tried that when I cleaned it...The serial Number is stamped there, matching the one on barrel. There are 3 or 4 major Italian gunmakers who produce virtually all the traditional-appearing smokepoles. Pedersoli is one of the best, but they usually identify their products. Chances are even if the gun carries one of the familiar names like Traditions, Lyman, or a few others, it's a rebadged Italian product. I've owned several no-name percussion guns that shot well. Flintlocks, not so much! I had to totally redesign the flash hole liner setup on my Traditions flinter and reharden the frizzen to make it fire reliably. A good Chambers or Siler lock will cost as much or more than the rest of the rifle if someone chooses to upgrade a balky flint lock. The one in the picture looks like a virtual clone of my first Hawken-style .50 caliber rifle from about 30 years ago. I bought it used for $55.00 and put a lot of venison in the freezer, rust-pitted barrel and all. I used green plastic sabots and 180 grain Hornady .44 caliber pistol bullets in it- - - -the pitted barrel would shred a patch and throw round balls everywhere! Jerry is spot on....the country was flooded with them after "Jeremiah Johnson" came out. "Italian" can mean a number of things - not all of them good. Only way you're going to know you got a good one is to take it out and shoot it. Have you removed and inspected the lock? Looks like a kit gun, and there's no way to tell who made it if it's not on the barrel. Hardwood stock, generic hawken design. Could be any maker in Italy. They made some pretty good muzzle loaders. Pietta made a whole bunch. I'll take the lock off today and look it over. If the set trigger will fit my .45 Cal Kentucky, I'll swope them...Thank guys. By the way, can the barrel be counter bored about 1" or could it be a smooth bore? Don't see any riffling at muzzle , looks a little like it hex bored.Is this possible? I don't see how it can be hex bored. Maybe has a false muzzle for loading. I also doubt a smoothbore gun would have a set trigger. If you're going by the shape of the patchbox- - - -I buy them in bulk as raw castings at muzzleloader shows all the time. That general design is generic to several manufacturers and most of them use the same mass-produced stock furniture. That one sold for less than $150.00 new in the 1980's, and the design hasn't changed at all- - - -the prices just grew. Some of the barrels have a short section of smoothbored muzzle to aid in loading. Most of them have 6-groove cut rifling and as long as BP salts haven't eroded big pits in the barrel they're pretty accurate. Let me suggest losing the rear sight and replacing it with a Lyman tang-mounted peep sight. It increases the sight radius by about 6 or 7 inches, and really improves the accuracy. It uses one of the existing tang screws, and only one extra hole needs to be drilled and tapped. Mine will hold about a 2" group at 75 yards with the peep sight and patched round balls. Not target accuracy like the chunk gun, but definitely "minute of deer"! Gene is on target about the hex bore. If you can't see rifling in the muzzle the piece has most probably been "coned" by a former owner. Probably not by the manufacturer. Coning a bore is a trick used to make loading easier and faster. Simply ream out the rifling in the muzzle for a couple of inches and it'll load faster. This must be done correctly, however, or it will have a negative effect on accuracy. The Cabela's Hawkens were made by Investarms, in Italy. If you're going by the shape of the patchbox- - - -I buy them in bulk as raw castings at muzzleloader shows all the time. That general design is generic to several manufacturers and most of them use the same mass-produced stock furniture. Not according to Cabela's Pedersoli and a couple more made their Hawkens, they sent me a list but pedersoli was the one with coil springs. Almost all of them now have coil springs. I've owned several Pedersoli BP rifles and they were all marked Davide Pedersoli. Proof marks are not done at the factory but at a proof house, so there's no clue as to who made it from the proof marks, only what country it was proofed in. 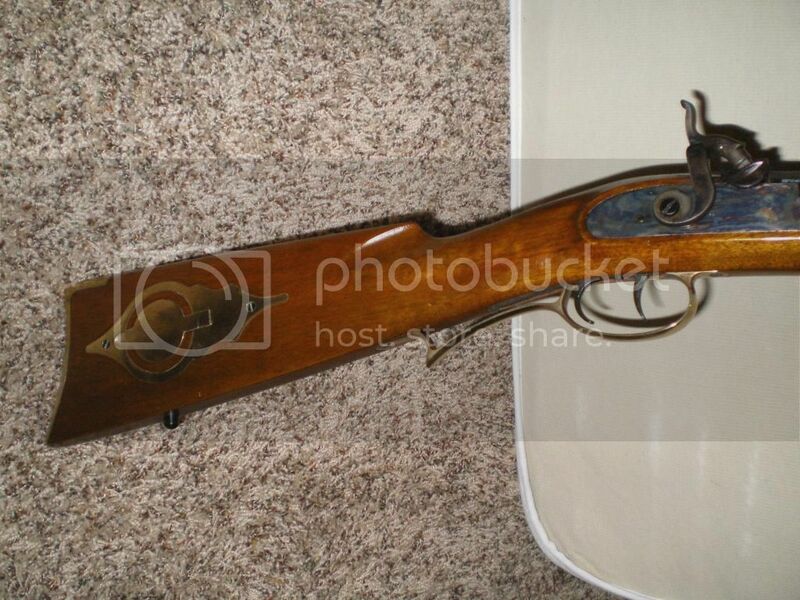 Also, all Pedersoli rifles I've owned had European walnut stocks. My Lyman Plains rifle which is marked but I can't remember by whom also has a walnut stock. It doesn't have a patch box and has steel furniture. Also, that's not a $450 rifle. And it's not a Cabela's as it has a hardwood stock. You are right about the stock, it's a hard wood of some kind, no walnut there.. Brand or cost really doesn't matter- - - -if it shoots, enjoy it!